It seems Diwali is nearer than we thought it was. Usually on a Diwali weekend, Bollywood serves us with the best of their cookies. But it seems, this year, September 9 will be the day when industry's three heartthrobs Shahid Kapoor, Ranbir Kapoor and Imran Khan will strike the chord together with Mausam, Rockstar and Mere Brother Ki Dulhan respectively. Shahid's Mausam has been postponed to release on September 9. This will mean that a stiff competition between the three is also expected. The producers of Shahid Kapoor's Mausam have admitted that the film will be postponed from his original release date of July 22. "I am sure all three films are good. We find September 9 as the right date to release Mausam. Now let the best man and the best film win. Let the audience take the decision," says the producer of Mausam, Sheetal Talwar. But shedding light on the expected business of the three films, Trade Analyst Taran Adarsh does not seem too happy with the three releases together. He says, "Even a Diwali weekend is not enough to accommodated three releases. And a non festive weekend by no means will be enough for three such big films which clashes three teen heartthrobs. The business of each film could get affected by almost 40 per cent." Kunal Kohli might have signed Shahid Kapoor and Priyanka Chopra for his film to cash in on their real life relationship but all his dreams have gone down the drains, as the couple have parted ways. Sadly, the couple keep distance from each other and hardly interact on the sets of the film. It is said that Shahid and Priyanka are extremely professional and try to look convincing on screen but they go to their own cells once the camera is turned off. They hardly talk to each other on the sets. “The relationship is over. And though Kunal Kohli had full faith in Shahid and Priyanka's professionalism he was wondering what the aftermath of the breakup would be for his film. He needn't have worried. The pair is absolutely professional on camera. It is off-camera that the aloofness between the two becomes easily discernible,” The Times of India quoted a source as saying. “The interaction between them is minimal, almost nil. Once they give their shots they are strangers to one another. Considering the film has essentially two characters, Shahid and Priyanka, running through a gamut of emotions and spectrum of characters, the effort required to share a mutual passion on screen is a task,” added the source. Well, we hope the duo will look like a couple at least on screen! 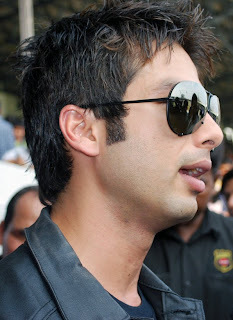 Shahid Kapoor requested and got the one gift for his father's birthday that the older Kapoor most craved for. A day off from the shooting and post-production of Mausam. Says a source, "What Pankajji really wanted was not a party. That was the Mausam producer Sheetal Talwar's idea. Pankajji loves to spend his birthday every year with his wife Supriya Pathak and children. This year it seemed impossible because his directorial debut is reaching completion. It was Shahid who requested the producer. All work came to standstill on Sunday when Pankaj Kapoor spent his birthday in the way he enjoyed the most." The night before at the party hosted by Mausam producer Sheetal Talwar, Shahid made sure his father had a good time. On Saturday night to bring in Pankaj Kapoor's birthday bash thrown by producer Sheetal Talwar at the Pali Village Cafe, Shahid Kapoor wouldn't leave Sonam Kapoor's side from the minute she walked in. Says a source, "Sonam actually wanted to beg off from attending the party. She had done two shifts that day for Mausam in the morning and Players in the afternoon and was really tired. But Shahid insisted she come for a while at least as it was his father's birthday. Sonam walked in late in the night and stayed almost till the end of the party. Shahid played the perfect host with her. He was by her side throughout. He was seen trying to entertain her throughout. Though they never had any drinks, they were constantly laughing and joking and entertaining one another." Significantly, says the eyewitness, Sonam was the only guest that Shahid saw off to her car. "We were having the party for Pankajji on the first floor. Shahid insisted in accompanying her down to her car. He returned to the party only after she drove off happily."